The 2,500 year old history of the town of Hamadan stretches back into pre-Christian antiquity. With half a million inhabitants, it is a central market town for all the goods necessary for daily life. 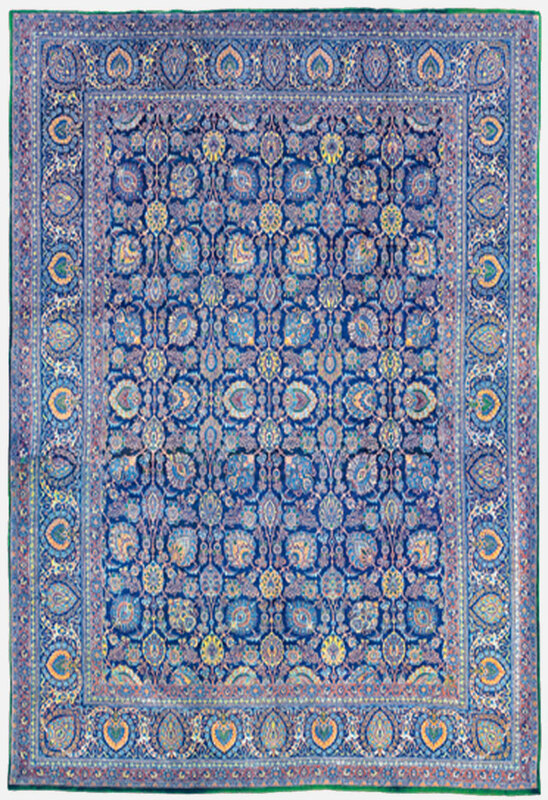 Although the earliest known Hamadan carpets probably dated from about A.D.1800, carpet weaving in the town probably has a much longer history. Today, however, Hamadan has a greater significance as a carpet market than as a place of production. The state workshops produce very good products such as the ‘Ekbatanas’ already described while the smaller private workshops weave the consumer pieces especially the smaller formats, known as ‘shahrabaff’,literally ‘knots of the city’. Hamadan carpets come onto the market in very different qualities. New carpets, with the exception of Ekbatanas, are mainly unpretentious commercial goods. Old and antique Hamadans usually runners are scarce and sought after valuable collectors pieces. This excellent piece has a design of all over Shahbassi with big palmettes and leaves both in the borders and the field. This piece can be used in heavy walking area.